I’m so excited for today’s post! 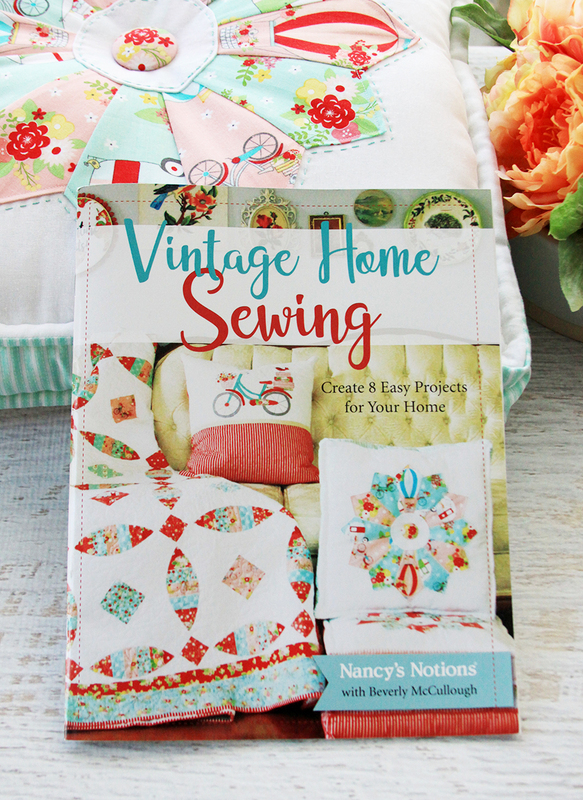 We’re kicking off the Vintage Home Sewing blog tour today – and we’re having a giveaway! But before we dive into the giveaway I want to show you around the book a little more! Vintage Home Sewing is made up of eight sewing projects that range in time and skill level so there is something for everyone! You can find projects like a simple coaster set all the way up to a throw-size quilt! The quilt in the book is called the Diamonds and Rings quilt. I wanted to create a quicker version of a wedding ring quilt. This cute quilt uses applique for the “rings” portion and it’s so fun to put together! You can have a lot of fun fussy cutting the diamonds too! I created two versions of all the projects in the book so you could see them in different colorways. I wanted to give you a couple different ideas for inspiration for each project! Here’s a more of the fun projects in the book! I love how the Dresden Pillows look made up in different Riley Blake Linens and Grandale fabrics! 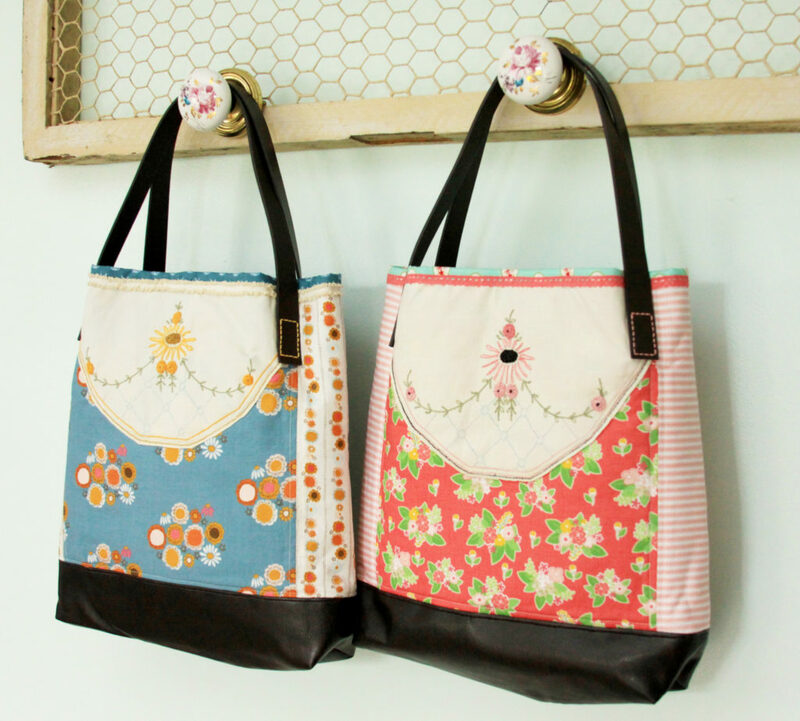 These Vintage Totes are such a fun way to give a vintage embroidery piece that’s been damaged a new life! I made up one version in Vintage Adventure and another in my favorite prints in the Guinevere collection – they are so retro and delicious!! And as a fun note – the two embroidery pieces I used on the totes were actually on the same embroidered runner – just at different ends! I have no idea why the sweet person who made this originally embroidered one end of her runner in pink and one in yellow but I love her for it! You know I had to include an embroidery project in the book too! 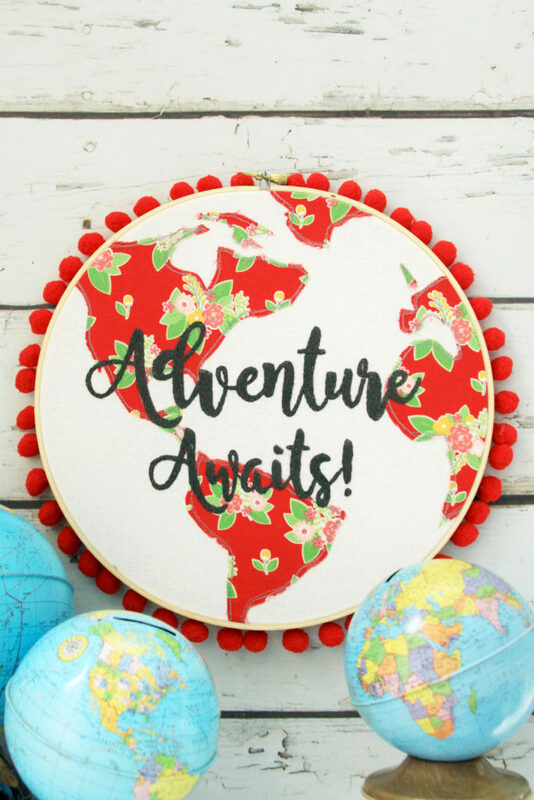 This Adventure Awaits hoop is so fun to stitch up – and it would make a great gift too! One of my other favorite things about the book is the price! 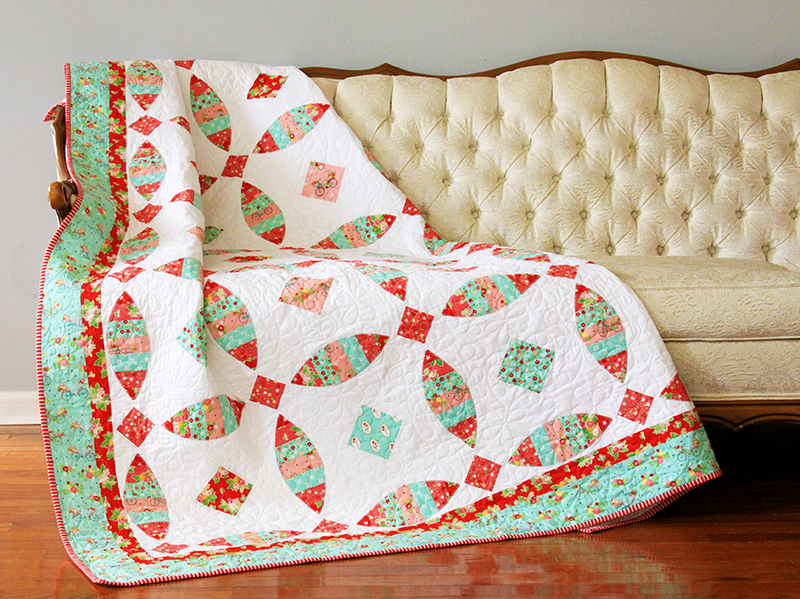 It’s only $9.95 – so you can eight projects for about the price of one quilt pattern! As I mentioned at the beginning – I’m kicking off the Vintage Home Sewing blog tour this week! Every Friday for the next couple of months we have an amazingly talented creator sharing the book and projects. Here’s a list so you can check everyone out! Rocks Stars right?! I can’t wait to see what they do! 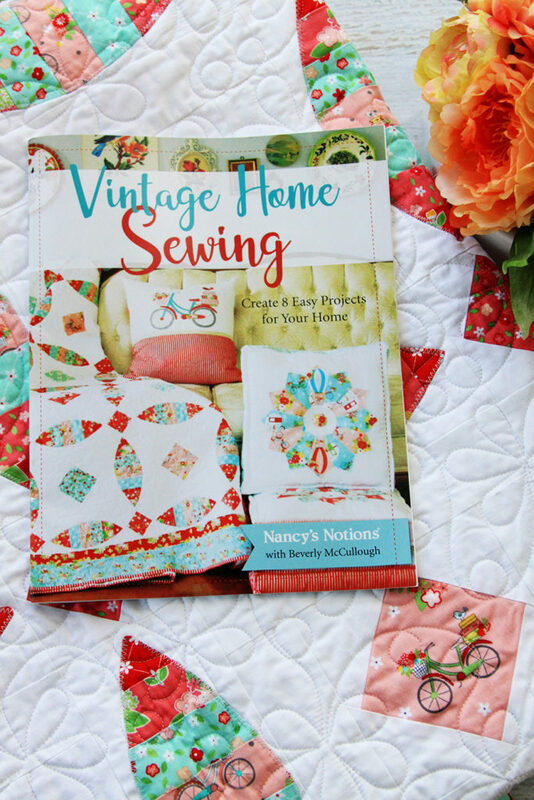 To celebrate the launch of the book and the blog tour, I’m giving away a copy of Vintage Home Sewing and a half-yard bundle of Vintage Adventure fabric! Enter the giveaway on the widget below. Giveaway is open worldwide and I’ll draw the winner the day after Thanksgiving! Good luck! I think I’d make the hexi coasters. I haven’t sewed anything for 2 years, so starting off small sounds good. 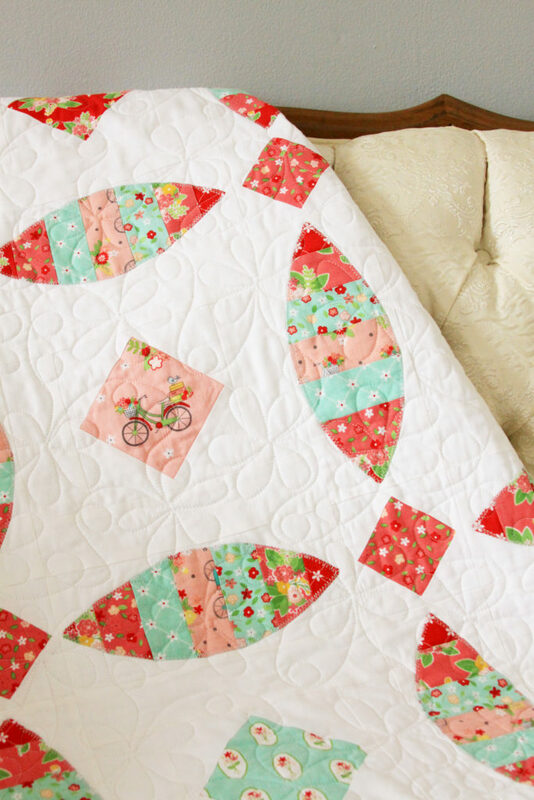 The quilt is so pretty (I love applique) & I probably need the bicycle pillow, too. I think I’d start with the bicycle pillow – so cute. You fabric is beautiful! Love your designs! I think I would like to make a quilted tote this with your cute fabric. Thanks for the chance to win, and I hope you have a Happy Thanksgiving!! Oh the tea towels are my first choice! Sooo lovely! Is there a possibility to get the book digital as I am from Switzerland and shipping is always a big thing? I love all the projects, but if I had to choose the first one, I guess it would be the Quilted Box Zipper Bag. Adorable projects and such a cute book, Bev! Congrats! Love the vintage fabrics. Inspires me to start quilting again. I really want to make the daisy bouquet dish towel. It is adorable! I always love your designs. And who can’t help but smile just looking at the darling fabric! I never made a proper patchwork piece but I want to do that some day. Winning this could give me just that motivation to really start doing it! I’d start with the bicycle pillow – and I also love the Dresden plate pillows. Great Christmas gift ideas! I already bought the book and am anxiously awaiting it’s arrival. I’d give this copy to my best quilty friend! Thanks for your generosity – can’t wait to see all the goodies and inspiration on the ‘hop’. Have a lovely Thanksgiving holiday. I would love to do the pillow first. I’m new to your blog and can’t wait to view more. Starting new project this book will offer. I am not a big sewer but I would like to try the pillow idea. But I want to do it in Christmas colors. I would LOVE to make the quilt and pillow – the fabric is AWESOME. I would love to start with the Dresden Pillow. The photos and the fabric used are so pretty. Love it! Thank you for this giveaway. I’d make the Dresden plate pillow first. I would start with the tea towels. I would love to make that cute pincushion. I think I would like to make the embroidered bicycle pillow first. I would luv to make the quilt. I really love the Diamonds and Rings quilt and that isnthe first project I would tackle in the book. Beautiful fabric! I would love to make a Dresden pillow. I love the vintage tires and the hexie coasters. I would start with the coasters since they are smaller. Your book is just what I need to add to my vintage collection (“all things vintage”). A purchase is definitely in my future (even if I win!)……. The Dresden Plate Pillow! I LOVE Dresden!! Beautiful fabric & finished projects! I already have some of the fabric. I loved it so much I bought some as soon as I saw it, but would love more. I would probably make one of the totes first and then a quilt! I’d have to start with the beautiful coasters! I’m a bag person–I’d love to make those cute bags first! I just adore the quilted box zipper pouch! That would definitely be my first project! I love these items and would love the book! Congratulations to you Bev for such an accomplishment. I love the cheerful projects. I’d love to jump right in and make the quilt. I LOVE your fabric! I would make the bicycle pillow – I have always loved bicycles and use vintage bicycles in my garden, and I also ride one! Then I would make the hexie coasters and then the towels. I love making pillows so I would start with the Dresden Plate pillows. So cute! I’m so excited to get this book! Very cute projects. I would like to try the quilt…so pretty! I love all of the patterns, I would be hard to pick. Would love to make the Dresden Floor Pillow first. Love the selection of quilt projects in this book. Thank you for the opportunity to win a fantastic giveaway. Those vintage totes are so cute. Now to find a good table runner! I love the bag with “rescued” embroidery. I have some pieces that my Mom embroidered (table scarves) that got chewed on by some mice that I haven’t thrown away yet. This gives me a great idea for keeping most of them. Thank you! I love everything about this book, but my favorite is the bag. I am a super amateur seamstress so I think the hexi coaster look like a very good place for me to start. I need to replace the sweet handmade coaster my mamma made for me around 20 yrs ago. The colors are perfect! I have admired all your projects for some time. Your fabric line is really fresh! I must make the bicycle pillow first! Been on a pouch kick lately – the zippered box has such a cute shape, plus love that decorative zipper! I have so much collected embroidery that the Vintage Embroidery Tote would be the perfect pattern to try first! Thanks for the chance to win. Awesome book…..Thanks for a chance to win ! I would LOVE to do the bicycle pillow! I would make the pillows and the tote! I am I love with this fabric! I’m partial to anything that works for storage, so I think the first thing I’d make from the book would be the small zippered pouch. I could probably use several of these without any problem!! :-) Thanks so much for giving us a chance to win!! I like the tote bags because I have a lot of vintage embroidered pieces that have seen better days and could be salvaged in this way. The tea towel is sweet also. I would be likely to start with one of these items. I’d love to make the embroidered totes. I would love to win this. It would match my needleminders from you. Love everything you do. Thanks! I like how you can use the Vintage Adventure fabrics as an EYE SPY adventure quilt. We love camping. I would love to make throw pillows with the new fabric. And, the book would be icing on the cake! I love watching your wonderful successes. The book is beautiful. I’d choose to start with that delightful Dresden pillow, but also the embroidered hoop. Congrats on all of it! I’d love to make a quilt with this fabric. Love your projects and I know I would LOVE the book! I have bought some of your adventure fabric, I love it and so does my little great grand daughter! The book would be great! The embroidered bicycle pillow is what I would love to make first. All the projects look great. Thank you. Love Love anything Vintage. So it would be wonderful to try this book and fabric. Beautiful! Your book is beautiful and I love all the projects. The first project I would make is the Dresden pillow. I would have a hard time deciding between the dresden plate pillow and the adventure awaits hoop! OH,the Tote Bag for my daughter for Christmas! Thank You so much! I would like to make the potholders first. I love this book & the colors of the fabrics. The Dresden plate pillow would be a fun project to make and one I could gift or use in my guest room! Oh, there’s so many cute ideas but I think I would like to try the Dresden Plate Floor cushion first! I have fallen in love with the Dresden Floor Pillows…So many wonderful projects to make. I love Flamingo Toes. Everything you make is so cheerful! I love the quilted zipper bag. Definitely would try that. Thanks so much for the chance to win. What a lovely book! and I love that Adventure fabric! Your projects are very pretty and inspiring. Yay! I love that fabric and the book has some goodies in it I would like to make . I think I would start with the dresden pillow. This book looks awesome!! I think I’d explore the appliqué quilt first, but the totes also look like fun!! I would make the tote bag. Thank You for the giveaway. Oh be still my vintage heart just love the freshness, the colours and the prints. With the help of your beautiful new book, I can envisage some new adornments for my vintage style decorated home Thank you for bringing sunshine to my day. I love the little quilted box zipper pouch! Super adorable and handy! I would love to make the Quilted Box Zipper Bag. I would make the tote bag first. I love the design! The dresden pillow to start with! Love this sew much. I really want to do three adventure hoop to hang in my caravan. I love the Adventure Awaits Hoop! The Dresden pillow or the towel would be fun to make. Thanks for the draw. What a lovely looking book. I would make the tote bag as my first project. Dresden plate pillows will be fun. I would probably make the Vintage Embroidery Tote first. I’ve added the book to my Christmas wishlist. All the projects look so fun! Love the bicycle pillow, I would have to start with that. I have a lovely embroidered table cloth that would be perfect for making the tote!! The Diamonds and Rings Quilt would be my first project. I want to try everything! I’ve been a little hesitant to try hexies, but those coasters are pulling me in …. Awesomeness! Already ordered the book & should be here today! Dresden Project first up! Love love love Vintage Adventures & looking forward to Vintage Keepsakes now! I have searched local quilt shops for Vintage Adventure with no success. I would love to make the small quilt with it and fussy cut sweet bicycles! This book is so cute!! So many darling patterns! ❤️ Fingers crossed! Oh I love those Dresden pillows! So lovey, Bev. I’d make one of each right away. I’d love to win this book-i especially like the tote bags! I want to make the diamonds and rings quilt. What a fun book full of beautiful, doable projects! I would have to try your hoop project first. I’ve always admired your hoop art. I would probably do the super cute dish towel first! It is too cute! Love love love. Awesome win for someone. Oh my goodness I love the Dresden pillow! It’s like a grown up version of one of my favorite pincushions! I can’t wait to see all the makes in the book tour. Love those Dresden plate cushions, they are so lovely. Beautiful fabric and great book! Congrats and thanks for the giveaway! I bought a fat quarter bundle of Vintage Adventure last weekend. It is so cute. I cannot wait to make something with it. I would love to start with the towels! I love the Vintage Embroidery Tote, though there are some many beautiful projects. I love the color schemes and everything has that “comforting” feel to it that you get from things sometimes. Good luck to everyone! Love the book. I think I would like to try the embroidered bicycle pillow first. Oh I love them all!! I would probably choose the bicycle or the quilt pattern to start things off with your new book! I plan to make each project but my first is the quilted zipper boxy bag. I would totes make the totes first. I have been given several antique pieces that would be perfect in a new incarnation. I just love the little quilted box bag. I can think of dozens of uses for it. All the projects are so cute but I like the bicycle cushion the best! I would start with the quilt! Thanks for such a great giveaway opportunity. 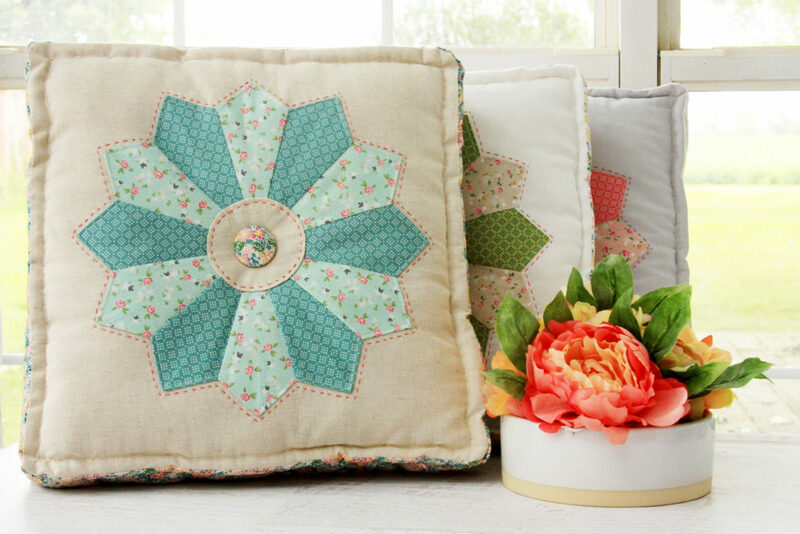 These projects look so fun especially the Dresden pillow! I love the book and fabric. I would make the bicycle pillow first. I love all the fun goodies you always make and am so excited you have a book and fabric out now so I can really have fun making your fun things! These are all my favorite colors too Thanks for the giveaway! I love this fabric line. I made a dresden daisy wall hanging with it! Those fabrics are just great and the book looks very interesting too!!! I love the Diamonds and Rings quilt. I have been sewing for many years and have only dabbled in quilting. I can’t wait to do more! Thanks for the inspiration and for the opportunity to win a copy of this book! Excited for it! Hard to decide, but I think I would like to start with the Dresden pillows. I love the look of the fabric with the Dresden plate. And then there is the zippered box and…. I’ddefinitely start with the hoop, I love all your hoop ideas :). Thank you for this opportunity! I would love to make the wedding ring quilt on the cover!! What a wonderful book with darling projects. Thank you for launching the peek at the inside of it!!! The dresden pillow is so cute oh and the hexie coasters! Love the vintage fabrics – would either make a quilt or a tote bag. I’m a beginner so I would start with the hexie coasters! Thank you for the blog tour! Is always fun! I love any thing Vintage, so making something that looks Vintage would be so Awesome! I would make the tote bags — love them! I just found your blog through the Aurifil Designer list. 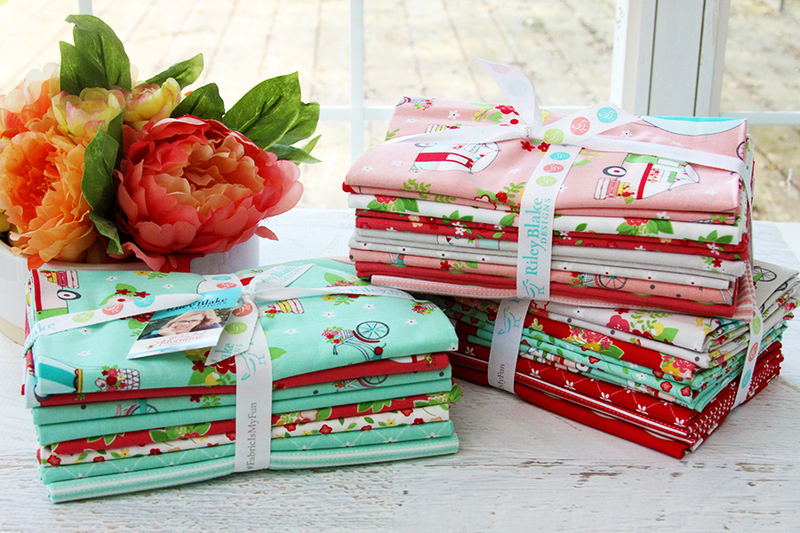 The book and fabric giveaway are a bonus – they look awesome and I’d love to win! I love all of the projects shown. I would like to make many of them. Oh I love this book. I would make the dresden pillow first. I would make the tote bags! I’d love to do the Bicycle Pillow. Adorable! I’d like to try the embroidered bicycle pillow! I am excited about this, I had put this book on my Christmas wish list!